It is with great pride and pleasure that I send you our new domain name and email address. Ara has been working with some of the most marginalised people in society for over 30 years. We work with those whose lives are affected by alcohol and drugs, gambling addiction and mental health. All these conditions come with high levels of social exclusion. Passionate and courageous, determined and committed to our services users, we are enthusiastic innovators, creating and developing recovery focussed service. We are prepared to go above and beyond to ensure service users achieve their desire for change. Dynamic and capable, able to make our own decisions, and show leadership throughout the organisation. We are excellent problem solvers, becoming multi-skilled by having a willingness to learn and then to teach others. We have ambition for all of our service users. We will work in collaboration with partners to ensure we deliver to the highest standards. Enduring and committed to our service users, we are reliable and are flexible to meet changing environments and conditions. Innovation of new services will achieve our purpose, vision, and long term sustainability. As part of this process you will notice changes to our logo and publicity in readiness for the next stage of our organisations journey. All of us at Ara look forward to you all being part of a successful future tackling challenges and taking opportunities because We make life better because we believe passionately that people can change and recover. What’s the BigDeal? Problem gambling in today’s young people. 25,000 under 18 year olds are problem gamblers in the UK according to The Children and Young People’s Gambling: Research Review (December 2017, Gambling Commission), with approx. 1 in 9, 11-15 year olds illegally gambling every week. These striking statistics form a starting point in dispelling the myth that gambling isn’t a problem for today’s youths. In my work as the young people’s gambling project officer for Bristol’s Addiction Recovery Agency (ARA) in partnership with GamCare’s young people’s gambling project BigDeal, I have had the privilege to speak first hand to young people about their experiences and views around gambling. Young people from the age of 11 are very aware of gambling and in discussions they talk about how much they notice the heavy influx of gambling related advertisements in the media but many didn’t feel that there were dangers to gambling. The fact that an average of 370,000 of the UK’s young people up to the age of 15 go on to gamble each week before they are even old enough to legally buy a scratch card or play Lotto, is an eye opener for many parents and professionals working with young people. Professionals I have worked with admit that they centralise their focus on young people’s potential risky behaviours around the more obvious addictions such as drugs and alcohol, not realising that problem gambling can be just as detrimental to a young person’s life and has the highest suicide rate out of all addictions. This highlights how problem gambling in young people can be a real mental health concern and should be considered by professionals who have safeguarding responsibilities for young people. The question often arises regarding how underage people manage to gamble and research has suggested that this can occur due to a number of reasons starting with parents introducing them to the activities as something fun to do or non-regulated fruit machines, private poker games or bets with friends. These facts form just the beginning of where gambling can start for young people today but the risk increases considerably when the young person reaches an age where they can legally gamble. Significant increases in gambling activities in young people up to the age of 25 have included online gambling and a rise in the use of high stake Fixed Odds Betting Terminals (FOBTs) in bookmaker shops generating devastating losses for some young gamblers, in very short spaces of time. These facts drive our passion here at ARA for educating both young people and professionals that work with young people on the facts around gambling with FREE workshops that are delivered in organisations across the South West of England and South Wales. These workshops help to start conversations with young people about gambling in fun and interactive sessions and help raise awareness around how to make safe and sensible choices around any gambling activities they may get involved in. Professional workshops include training on how to screen for problem gambling and how to conduct a brief intervention with a young person if required. All workshops give clear information on how to seek help if problem gambling is identified to give young people the right support. If you’d like to learn more or book a workshop don’t hesitate to get in touch with me on Rebeccavials@addictionrecovery.org.uk . Together we can make a difference by making sure our young people stay safe around gambling. http://recovery4all.co.uk/wp-content/uploads/2017/08/ARA-gambling03a-1-e1523954026602.gif 477 717 Andrew Ridley http://recovery4all.co.uk/wp-content/uploads/2018/06/revised-ara-logo-website.jpg Andrew Ridley2018-04-17 09:30:502018-07-04 11:36:56What’s the BigDeal? Problem gambling in today’s young people. ARA’s Connect Psychology service is now at Bradley Stoke Surgery, South Gloucestershire three days a week. 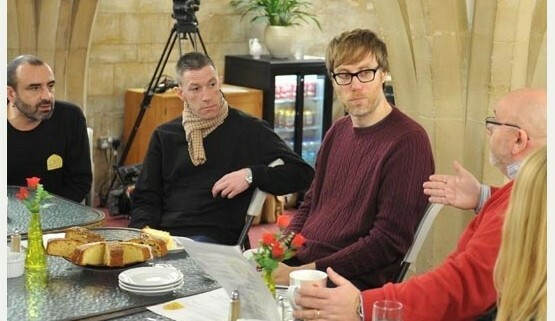 We were delighted that comedian, writer and director Stephen Merchant visited ARA’s Arc Café. The Arc Café, run in partnership with St Mary Redcliffe Church, offers fantastic food to its customers and has a huge impact on the lives of its volunteers. Stephen said , ” People need help to overcome their problems and projects like the Arc Café are well worth supporting”. To bring in the New Year, ARA is setting up “Friends of the Arc Café”. This will include businesses, individuals, enterprises and organisations. Our Friends will support the café with increased footfall, catering orders, sponsorship and donations. Treefest is a Christmas Tree festival held at St Mary Redcliffe Church for a full week just before Christmas. The festival raises money for local charities. Businesses, schools , community groups and charitable organisations are invited to provide and decorate Christmas trees. ARA’s Arc Café entered a tree decorated by volunteers. The café also served mince pies and alcohol free punch on the opening evening and sold tea, coffee and cakes at a pop up café throughout the week. We are very pleased to welcome staff from Avon and Wiltshire Mental Health Partnership (AWP) NHS Trust to our building at King’s Court, King Street Bristol.